If a student feels that they need extra support in a class, there are a variety of tutoring options available. The best first step is to set up time to see the teacher for additional help outside of class time. However, sometimes students might need more support in a particular subject. ​NHS offers peer tutoring to students who feel that they need extra help in certain subjects. There are student tutors available in most subjects, including all of the core classes, on Mondays through Thursdays after school in the media center. Tutoring is FREE for all students! 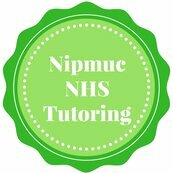 Please click on the green Nipmuc NHS Tutoring logo for more information. ​There are a number of local and online private tutors that student can get help from. Please contact the tutor directly to inquire about pricing, subject speciality, and availability. Click here for private tutoring options.